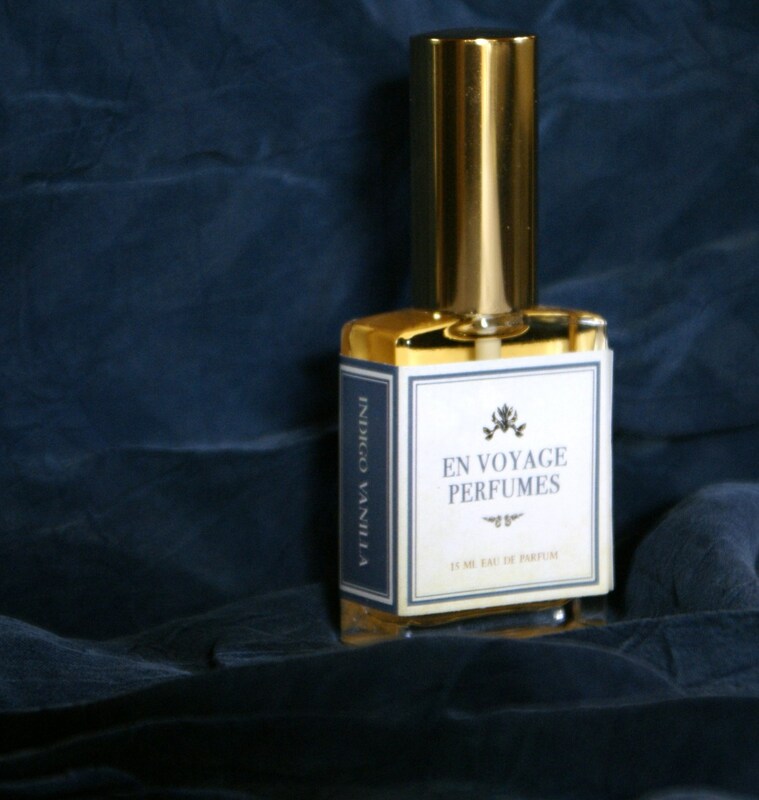 Shelley Waddington, the super talented perfumer behind En Voyage Perfumes, won many new fans last year with her stunning, vintage-inspired scent Zelda. This year her collection of three chocolate based perfumes “Souvenir de Chocolat” has already won her a number of awards and as the nights lengthen here in the UK, it feels like the perfect time to indulge in these top quality gourmands. Notes and accords: Sugared violet, chocolat chaud, crème douce, soft woods, vintage ambergris, vanilla alliage, tonquin musk. This is much more about violet than chocolate or vanilla. The flowers smell as if they have been crystalised in sugar and set atop a vanilla flavoured hot chocolate. It’s as if you’re inhaling the vanilla scented milky chocolate through a bouquet of cool, sweet violets. The drydown is gently musky. Indigo Vanilla is a violet fragrance that isn’t prim, saccharine or old-fashioned. I personally find it more lightweight and less affecting (particularly in the base) than the other two in the collection, but it’s an interesting confectionary twist on this traditional flower. Notes and accords: Classic Persian amber accord, dark South American chocolate accord, New Zealand beach-washed ambergris and a touch of bitter orange. Captured in Amber is salty and softly spicy with the moreish bitter edge of dark chocolate and a low, animalic purr. It’s comforting and warm the way ambers usually are. However there’s also a sensuality to it, in the same way an exquisite taste sensation can give you an almost indecent thrill. How often do we get real ambergris in our perfume these days? Its presence here is a very rare treat. Captured In Amber is by far the most potent and seductive of the three. I applied it at 8am one morning and could still smell it on my skin at 10pm that night. I think it’s wonderful and that’s really saying something considering ambers don’t usually work on me. Notes and accords: Vanilla powder, rose sugar, ground cardamom, bergamot peel, Espresso cafe, steamed milk, salt, dark cacao, rich whipped cream, soft amber, Himalayan musk, New Zealand beach-combed ambergris. I’m one of those weird people that doesn’t like the taste of coffee. Perhaps even weirder, I love the smell of it. I find that deep, dark and delicious roasted aroma very enjoyable. Café Cacao delivers all the aromatic goodness of coffee with none of the bitter taste. However, this perfume is not a straight-up coffee fragrance. In the beginning it’s the sweetest of the three and resembles a creamy dessert with a shot of expresso thrown in. The sugary, frothy head with accents of rose, spice and citrus peel gives a nice lift to the milky coffee beneath. But as the whipped cream melts, the powdery coffee and chocolate come through more and more, making it progressively drier. 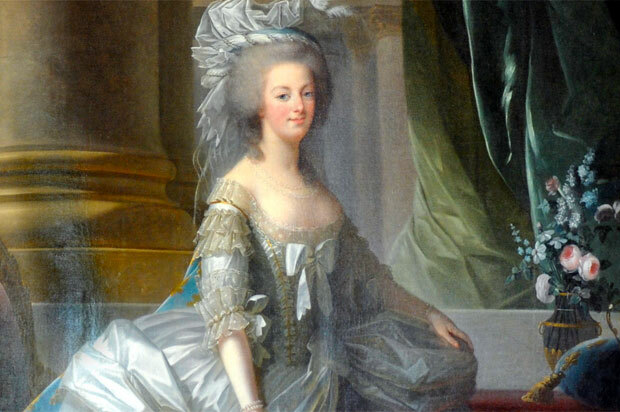 Marie-Antoinette was no stranger to decadence and is said to have taken ambergris in her coffee. The dry down couldn’t be further from the sweet start as the swoon-inducing combination of amber, musk and ambergris, along with traces of chocolate and coffee grounds, rolls over the skin. Cafe Cacao reminds us that coffee is a grown-up drink. Shelley has been kind to perfume lovers as well as chocoholics by making these fragrances available in 15ml EDPs (which I sampled) and 4ml extraits. 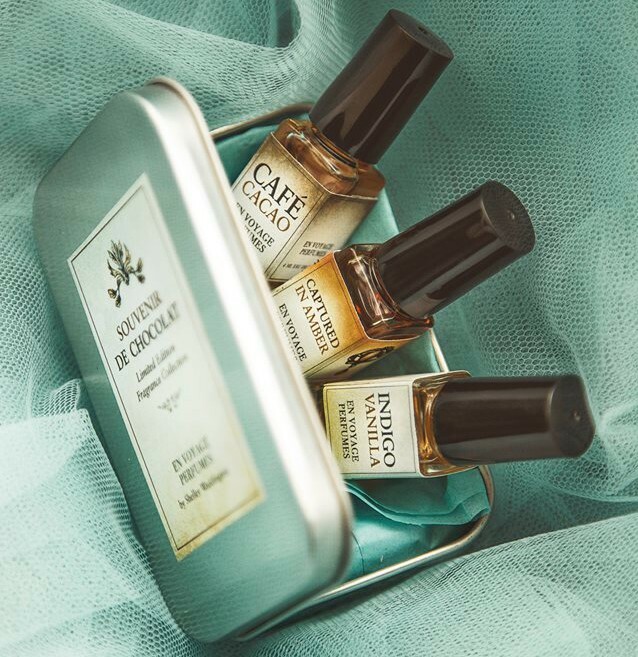 You can also buy a set of all three extraits as a coffret. 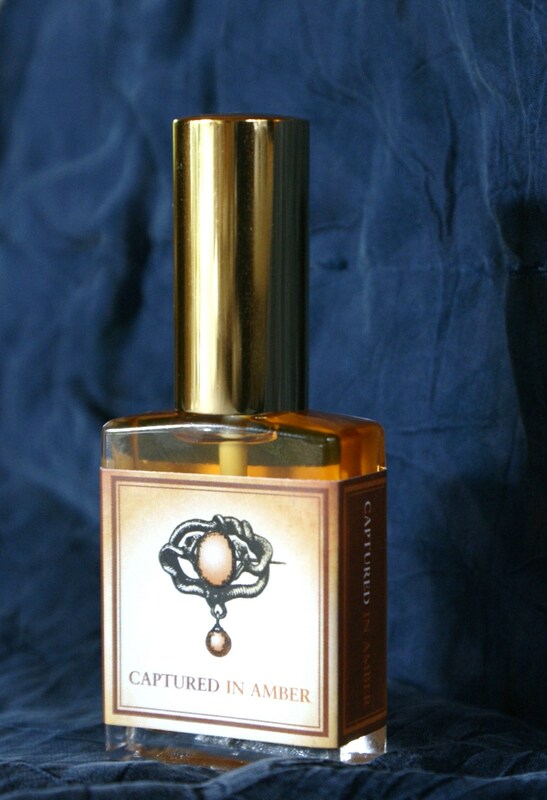 While each creation is a perfume in its own right they have been designed to combine easily for layering. This way you can cook up your very own culinary inspired fragrance confections. Do you have a love of chocolate? Are you a fan of it in fragrance? This entry was posted in Amber, By Tara, Fragrance Reviews, Gourmand and tagged En Voyage Perfume, Fragrance, Gourmand, Perfume, Review, Shelley Waddington. Bookmark the permalink. The trio is perfect for gourmand lovers. That’s fantastic, Annie! So pleased. Have a great birthday and enjoy the Trio. I don’t normally do gourmands or ambers so Captured in Amber was quite a revalation for me. I love chocolate notes if they are dark and on the bitter side. The one in Tubereuse ! is great. I love the thought of Marie-Antoinette traking ambergris in her coffee. Is it possible to be more decadent than that?! Sandra, you describe them so well. You really would need to be a fan of at least the aroma of coffee to appreciate Cafe Cacao, I agree. I’m sure you’ll get through winter with the comfort of some warm, cosy perfumes! I very much like the sound of the Amber and the Coffee one (violets just don’t work on me…) – will try to test them. En Voyage do samples but I know it’s not always easy ordering from the States. I hope you get to try them at some point. Violets don’t seem to like me either! Those sound great for the cold snap we are getting. Comfort fumes. I love the smell of coffee and while I do like a cup as well I agree that the smell is usually much better than the taste. Chocolate is wonderful no matter how I consume it. Fragrance, candy, hot cocoa…yes please. Cold weather is a great opportunity to wear richer perfumes. I don’t usually like the smell of things I don’t like to eat or drink but coffee seems to be an exception to that. I agree chocolate in all forms is wonderful. I have even come to love the 70% cocoa stuff. I would certainly like to try them all, but Captured in Amber sounds particularly intriguing. I love chocolate, but it can taste and smell so different, from cheap and sugary to bitter, luxurious, salty and sour. The violets in Indigo Vanilla sound lovely, but I doubt I’d like the dry down. Violets coated in dark black chocolate,now that I’d love to try, someone please make it! Sabine, Captured in Amber really is something else. I hope someone makes your fragrance of violet coated in dark chocolate. They really should. These are awesome perfumes😊. Interesting to give it a try. I have never used a coffee one. They really are fragrances with a twist. So different from the norm. Mouthwatering reviews! I have these samples somewhere and really feel in the mood to retest them now in the light of your delicious prose. And real ambergris is indeed a treat. Like you, I am not a fan of coffee, so if I ever did develop a taste for it, I can’t see me wasting the stuff in a beverage, hehe. PS Funnily enough, I tested Providence Cocoa Tuberose yesterday. Weird bitter chocolate opening, but when it warmed up it was rather scrummy. I love Brulure de Rose of course, which has chocolate in it. Chocolate notes can really add interest. I still not sure about Musc Maori, or “Eau de Nesquik” as Thomas brilliantly calls it. Brulure de Rose is lovely. V, I’m glad to hear you have the samples. Do let me know what you think when you’ve had a chance to try them. Tara, thanks for these reviews! I am a life long coffee drinker but I don’t like it sweet; I love chocolate but don’t especially like to wear it. However, I think Shelley Waddington is brilliant and I always want to smell anything from En Voyage. Captured in Amber sounds like something I would like, as an amber fan (definitely a fan of smaller bottles, too.) I’m impressed that you have come to appreciate 70% cocoa chocolate! While I like strong coffee my taste limit for chocolate is stuck at 60%. Shelley Waddington is brilliant. I also want to try whatever she does. The recent Fiore di Bellagio sounds fabulous. I would definitely recommend Captured in Amber as you’re an amber fan. The small bottles are great. It did take a while to get used to 70% chocolate but I love it now. I do love gourmands and enjoy both eating and wearing chocolate (white, milk, dark…I love ’em all!!) 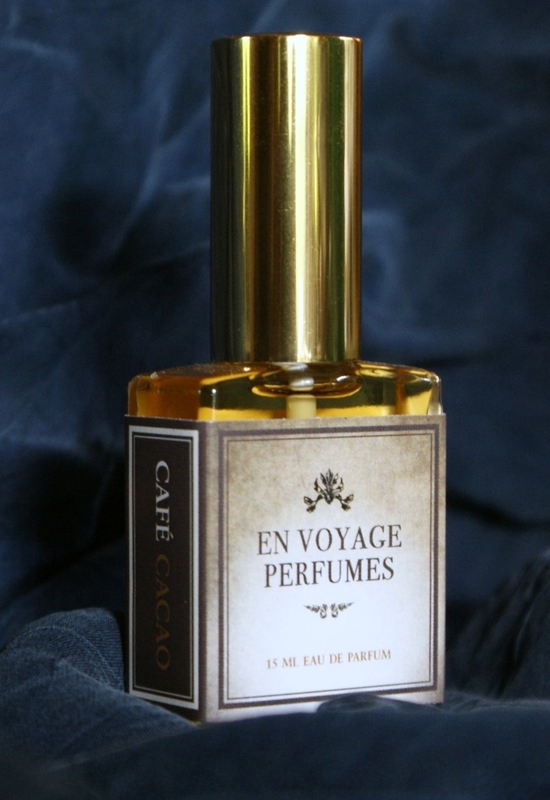 My favorite cocoa perfume is SSS Cocoa Sandalwood…in the winter I crave these type of scents and I actually make a very affordable moisturizing body oil with lavender absolute and cocoa absolute diluted in sweet almond oil….these fragrances from En Voyage sound right up my alley! Thanks for the review and link 🙂 !! Cocoa Sandalwood sounds fantastic. Senoma Scent Studio’s fragrances are so affordable too. I bet your body oil is fab! Tara, you make all three of these sound scrumptious. I’m a coffee lover, so I think Café Cacao sounds like the one that has my name on it, though your description of the chocolate amber is rather intriguing too. Was the amber your favorite of the three? Suzanne, you’re as perceptive as ever. Yes, Captured in Amber is indeed my favourite. The combination of the dark chocolate and the salty amber is just so eye rollingly good. I think you’d really like it. Sounds like these are ticking all the boxes for you Undina! Tara these sound absolutely gorgeous. I actually like the sound of all three and the 15ml size sounds perfect. I actually won a sample of Fiore di Bellagio and it is exquisitely beautiful and I highly recommend that you get hold of it. It feels very old school but very pretty as well. The bottles sizes are great aren’t they? They are quite potent fragrances too so you only need to apply a little. Thanks for your Fiore di Bellagio recommendation. I’m pretty sure I’d love it. I LOVE chocolate. It makes any situation better; it can turn around a dreary or stressful day better than anything for me. That said, I’m not fond of chocolate notes in perfume. Because of that I would probably pick the Amber to try. It sounds much less gourmand. Thanks for the review! Thanks for reading Kandice. I love the soothing properties of chocolate but Captured in Amber is the first “chocolate-forward” perfume I’ve fallen for. Hmm, I’m not a gourmand fan but Captured In Amber sounds lovely. I’m going to have to sample this one. Michael, I’m not good with amber or gourmands but Captured in Amber totally won me over. Hope you like it too. I thought of you and your search for the perfect coffee fragrance! Cafe Cacao is very sweet to start with but give it a go if you think you’d be okay wiht that. Also definitely try Captured In Amber and Fiore di Bellagio if you end up ordering samples. Let me know how you get on.